When solar rooftop FiT scheme was introduced in 2011, many prospective applicants lamented the difficulty in getting financing for the installation of home solar PV. Although cost has gone down quite substantially, price for a typical 4kWp solar PV system is RM40,000, which is still expensive. Here comes the answer, or at least an alternative. 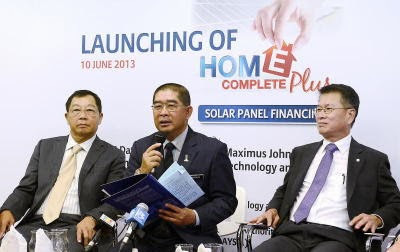 A couple of days back, Alliance Bank Bhd came up with Home Complete Plus-Solar Panel Financing , a scheme developed jointly with the Sustainable Energy Development Authority (SEDA). It's a kind of personal financing scheme for solar panel. "I have been informed by SEDA Malaysia that for now, most of the houses which have solar PV systems installed and are able to benefit from the Feed-in Tariff (FiT) scheme are those where the majority of the financing comes from house owners." Energy, Green Technology and Water Minister Datuk Seri Dr Maximus Johnity Ongkili during the launching. Other than Alliance Bank, SEDA is currently in talks with Bank Negara on approaching another three banks, mostly local, to participate in the scheme.